Taking care of the landscape of your property can be a lot of work for you. You want to do all you can to keep it looking its best, but sometimes, even with your best efforts, there may be issues that arise that are beyond your expertise. If you are having issues with some of the trees on your property where the trees are damaged from storms, weather or pests, the trees may need to come down and get removed. This is no easy task for the average person, which is why it is a good idea to look for a professional service to help you. It is a good idea for you to know what is involved in tree removal in the San Fernando Valley, so you understand why it is best left to the experts. When you hire a professional service like ours at Your Way Tree Service, Inc., the first step involved for us is to perform an assessment of the trees on your property. We will take a close look at the trees in question to see what condition they are in, what the location is like and what obstacles may exist in taking down the tree safely. Once we take a good look at the trees in question, we can then come up with the best approach to perform the tasks for you and let you know how we will proceed. For the safest tree removal in the San Fernando Valley, we take great care in performing each step of proper removal. Most often, trimming is needed first to make sure major branches are removed piece by piece. This allows us to have greater control over the tree and reduce the risks of any damage occurring when the tree comes down. Once the conditions are right, the tree can then be felled safely. We will then saw the pieces and carefully remove the tree from your property. If you need tree removal in the San Fernando Valley, you want to make sure you hire a professional service like ours at Your Way Tree Service, Inc. We have vast experience in the industry, are licensed, bonded, and insured and can offer you the best tree services in the area for the right price. 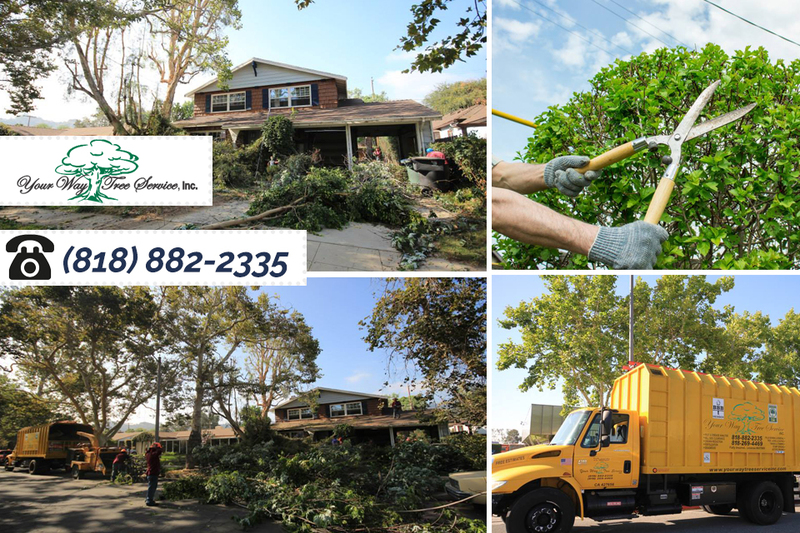 Give us a call at 818-882-2335 to arrange an appointment for an assessment of your trees so you can learn how we can assist you with safe and proper tree removal.